Has the Spring Lawn Care Season in Vancouver Begun? Home/Lawn Care Tips, News/Has the Spring Lawn Care Season in Vancouver Begun? It has been hard to tell if spring has arrived to the Vancouver lawn care season. Cold and wet weather has predominated and most home owners have not even considered cutting their lawns yet. Are the lawns growing? Yes! Make sure that you are out on your lawn walking through it and taking a look at its condition right now. Often a lawn seen from a distance can look like it can wait for the next sunny day for a cut, but when you walk on the lawn it is well over 4 inches. Remember that lawns in the Vancouver region usually are healthiest at a height of 2.5 to 3 inches and that you should try not to cut off more than 1/3 of the blade. Cutting more than 1/3 of the blade off at a time can shock your grass and create a weak lawn. Wet weather can prevent you from aerating your lawn because it is too soft. Try to watch the weather and check your lawn for puddling or soft spots. If you are not sinking in you can proceed. You can hire a professional company to aerate and maintain your lawn or rent one. Renting an aerator can be an adventure in itself. Make sure to rent a commercial version and that the tines ( what removes the cores) are the correct length and not worn from too much use. You will need to have a truck or trailer to pack the machine. Commercial aerators weigh 250 or more pounds and will have extra weights to increase penetration. Start off slowly as this machine can get out of control quickly. Look at the cores that are being removed from the ground. Are they long enough? Check the hole is it deep enough? Add the extra weight if needed. The depth of the core can be affected by the soil compaction. Most home owners can expect to spend around 4 hours for a 2000 square foot lawn from rental to return. Avoid renting aerators that are only spikes. Use machines that remove cores and provide a deep core aeration and have a great lawn care season. Robert loves his wife and family and is a huge Star Wars fan. He bikes and does travel biking. His company portfolio includes our Commercial, Strata, Industrial, and Retail business accounts that service clients from West Vancouver, North Vancouver, Burnaby, Coquitlam, Surrey, White Rock and parts of New Westminster. 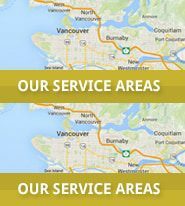 Vancouver's Lawn and Garden Care Experts. 20 years of trusted service.